Douro Elegance is one of two identical sister ships launched on Portugal's Douro River in 2017. 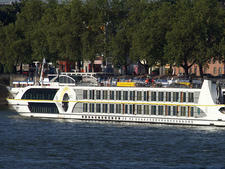 U.K. tour operator Riviera Travel charters the ship and also offers cruises on the sibling vessel Douro Serenity. 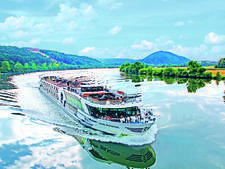 The 126-passenger vessel, classified by Riviera as "five star" was built by the Portuguese company DouoAzul, which has been operating for more than 25 years and retains ownership of the vessels that it charters to various river cruise lines. 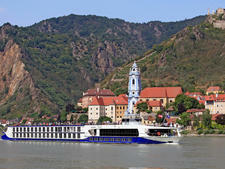 In order to fit into the Douro's five locks, Douro Elegance -- in common with other vessels on the river -- is smaller than the typical ships that sail on the Rhine and Danube. 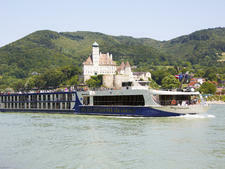 However, it contains all the facilities you would expect on an upmarket riverboat. 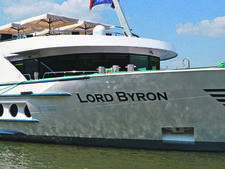 It also boasts a high ratio of 3:1 passengers per crew member, ensuring personal service and the friendly small ship feel that is a trademark associated with Riviera Travel's cruises. All cabins are river facing and spread across three decks. The smallest cabins are situated on the lower deck and measure 151 square feet. They all have fixed windows. The standard cabins on the middle and upper decks all measure 161 square feet and have floor-to-ceiling windows that slide down halfway. Standard amenities in all cabins include marble bathrooms with a shower and fully frosted screen, and elegant polished hardwood finishes complemented by a warm Mediterranean color scheme. There are comfy hotel-style beds, with individual duvets, which can be configured as twins or doubles. The cabins all have individually controlled air conditioning, a desk and two chairs, flat-screen high-definition satellite TV, hair dryer, safe, telephone and tea and coffee making facilities. The onboard voltage is European two-pin 220v, so passengers need to bring adapters. The ship's suites are all located on the upper deck. The six Superior Suites measure 237 square feet, and have a larger living area and bathroom with twin wash basins. The pair of Deluxe Suites measure 323 square feet, and in addition to the standard floor-to-ceiling window they have a second full-length window that opens down halfway to create the feel of a balcony within the suite, with two chairs and a table. Public areas include a lounge bar with panoramic windows, a small fitness room, spa and a sun deck with plenty of lounge chairs and a splash pool. All meals are served in the restaurant, which can seat all passengers in one sitting at tables for four, six and eight. There is an open-seating arrangement so passengers can choose where they want to sit and with whom they want to dine. Breakfast and some lunches are served buffet style, and an early riser's breakfast is served in the lounge. Dinner is a combination of buffet and menu items. Self-serve coffee and tea are available 24/7 and tea and coffee are served to the table with meals. Red and white wine, beer and soft drinks are included at every dinner, and complimentary water is served with lunch. Bottled water, speciality coffee and alcoholic drinks are available at additional cost. The onboard currency is the euro. Special dietary requirements, including low salt, low fat, gluten-free and diabetic, can be catered for if requests are made at the time of booking. There is no doctor onboard, however a crew member trained in first aid is always available and medical personnel can be summoned aboard quickly in a case of emergency. The recommended gratuity is 10 euros per person, per day. 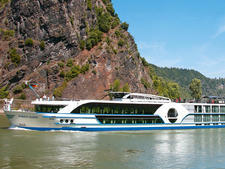 This covers tips for the crew and local guides and drivers on shore excursions. 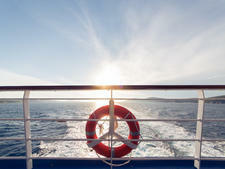 Free Wi-Fi is available throughout the ship and laundry and ironing services are provided for a fee. There is an elevator to all three passenger decks and, notably, there is a chair lift to the sun deck, which is a rare feature on river vessels. 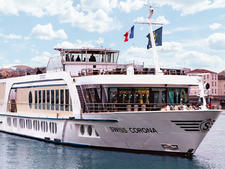 Douro Elegance sails seven-night round trip cruises from Porto, situated at the mouth of the Atlantic Ocean, to the Spanish border and includes a day trip into Spain to visit the historic university city of Salamanca.